Was £199.00 - Now £179.00! Stellar mirror. This striking contemporary mirror has two large and two small bevelled square mirror panels and a chrome effect backing frame as can be seen in the detail image below. 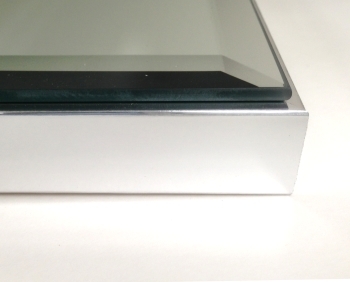 The central section of the mirror is open to reveal the chrome effect frame, and the whole mirror is also edged in the same frame.